Peach Tiramisu is a light and tasty version of my favorite dessert, I hope you enjoy it! I want to share this delicious dessert I made to celebrate Labor Day. After making a small tiramisu for a friend, I had to decide what to do with the leftover cream. 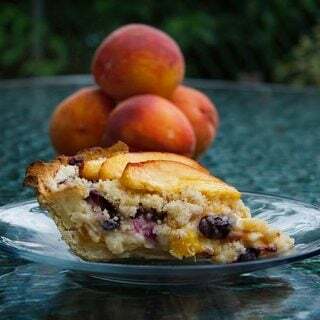 The peaches this season have been so juicy and so sweet, and I knew right away that I wanted to incorporate those delicious peaches into my dessert. I also knew that it needed a little color, and as luck would have it I had a flat of perfect red raspberries in the fridge. 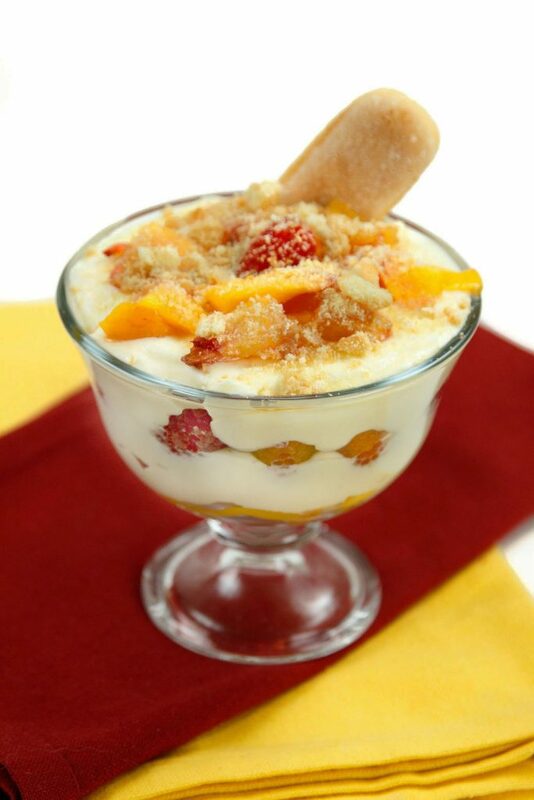 It was a match made in heaven, sweet juicy peaches, red ripe raspberries and luscious Tiramisu cream! Of course, I had to use a few ladyfingers just to make it official, but rather than place them in the layers, I thought a crumble with a bit of a crunch would be a nice touch! 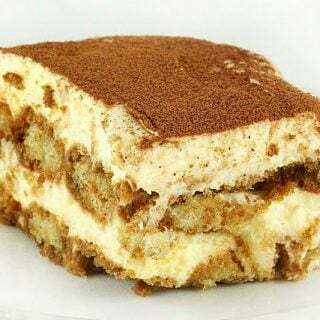 I see so many Tiramisu recipes out there, and most of them are not really A Classical Tiramisu. 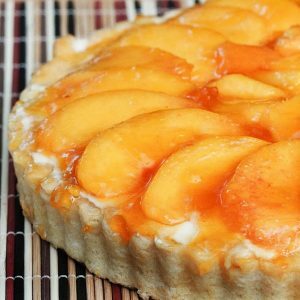 It takes a little time to make this dessert properly, but the results are well worth the effort. I promise you a dessert that will put your favorite Italian restaurant to shame. 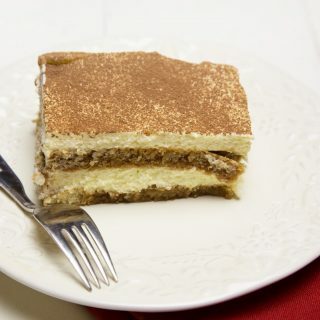 If you would like to make the classical version of Tiramisu Click on this link for the Recipe. 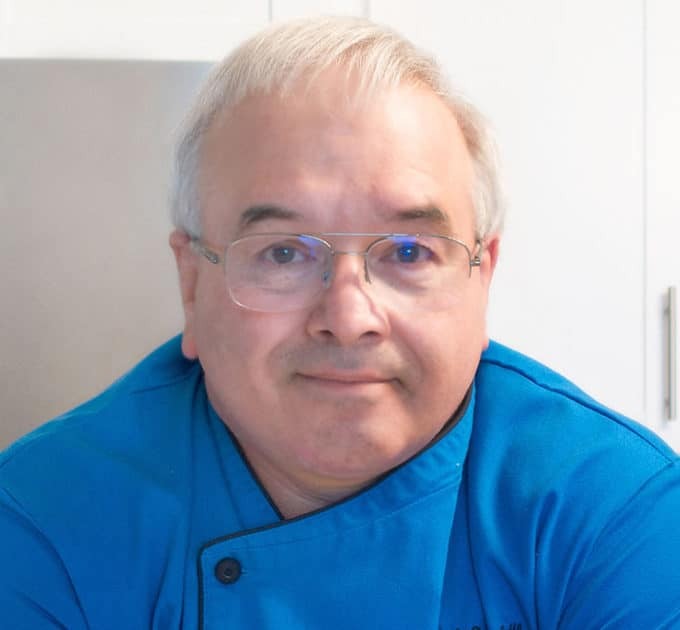 HI CHEF DENNIS , I REALLY LOVE YOUR FOOD BLOG !!!! I MUST HAVE READ SEVERAL HUNDRED RECIPES ALL OVER THE WEB , AND I REALLY LIKE THE WAY YOU MAKE THINGS AND PREPARE FOOD !! ARE YOU REALLY A CHEF ? I GUESS THATS WHY I AM SO INTERESTED IN YOUR FOOD !!!! I LOVE YOUR PEACH AND RASPBERRY TIRAMISU . ITS SO ELEGANT . I AM AFRAID TO TRY TO MAKE IT . I DONT COOK MUCH . BY THE WAY, YOUR RICOTTA CHEESECAKE IS AMAZING !!! I LOVE THE ITALIANISH STYLE IT HAS !! YOURE THE BEST !!!!!! I WISH I COULD WRITE TO YOU . ASK SOME QUESTIONS MAYBE ABOUT FOOD . yes I am a real chef, sort of retired now. I’m glad you like my recipes and most of them are not very hard at all as long as you follow the directions. Thanks Kristen! Tiramisu is a wonderful thing! What an original interpretation of tiramisu, Chef Dennis! I love it. It’s a very pretty interpretation as well. And who can resist ladyfingers?? Not me. This is sensational! I want to grab that cup of decadent dessert right out of the screen. Delicious delicious delicious!!!! This is a perfect dessert to enjoy while bidding summer adieu! I tried a lemon tiramisu this summer but I couldn’t quite get it to work, now you’ve inspired me to try again. Have a great week! 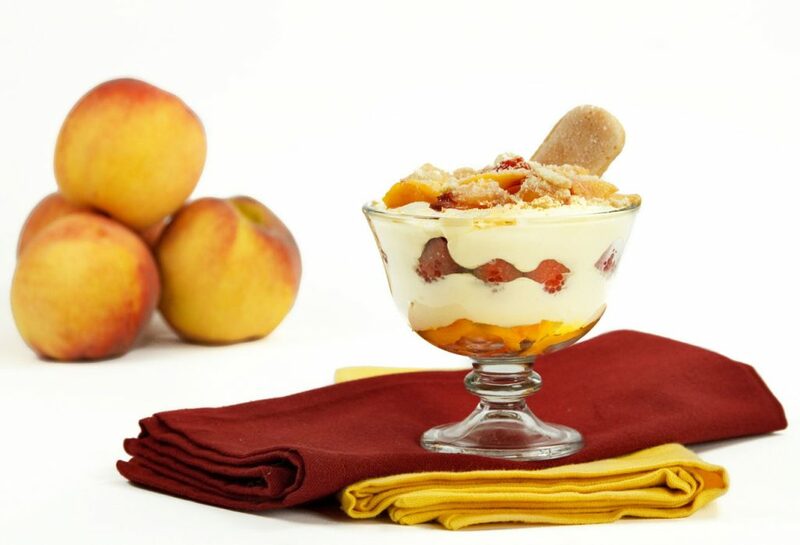 What a great idea to add peaches to tiramisu! I think is awesome! 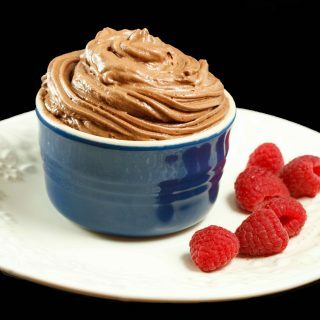 It looks delicious, irresistible to see the photo and not want to go to the kitchen to prepare it! Pinned to “recipes I have to do”! Classical or not, this looks perfect to me! Hope all goes well getting back into the swing of things. 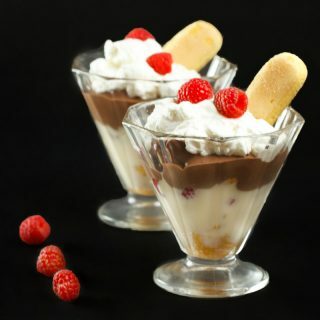 I love your version of tiramisu, so lovely! Love tiramisu. Never actually attempted making it on my own. But I love your version with stacking of fruits and cream. Yum! This really does look and sound fantastic. How does it differ from a trifle? I’m willing to dive in no matter what it’s called, actually. I have yet to try my hands at making tiramisu and after seeing how you incorporated the peaches into your tiramisu…I am very much inspired to make this delectable dessert for the family 🙂 and you know what Chef Dennis, I just want to scoop a mouthful from your enticing photo…the last one and get the virtual satisfaction…:p after which I am still craving for the real thing 🙂 Thank you for the last photo ..at least my eyes get the feasting ! Have a great opening tomoro ! I’m obsessed with tiramisu! I’ve never had anything but a traditional version, and I think you’ve just opened up a whole new world for me. Good luck with the new season Dennis!